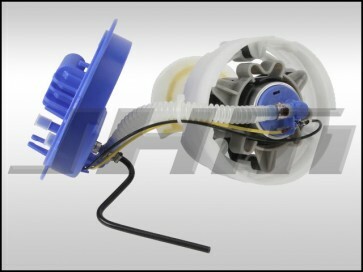 This is an OEM Fuel Pump Assembly for B6-B7 S4s up to and including model year 2006 (04-06). This pump comes directly from the same manufacturer that made these pumps for Audi and is the same pump you had in your car from the factory. NOTE: There was a VIN split on this part from the factory! If you have a late production 2006 or early production 2007 B7-S4, this split may effect your car. All B6-B7 S4s up to VIN 8E-6-265831 should have this pump. This split follows the same split as the fuel filter split on these cars. If you have a 4 LINE FILTER, you have this pump - an EARLY pump. If you have a 3 LINE FILTER, you have the LATE pump. Go back one section and add that pump to your cart. The OEM part number for this pump is 8E0906087R or 8E0 906 087 R. The fuel pump is located on the passenger side of your car, underneath the back seat. It is beneath a cover held down with three screws.